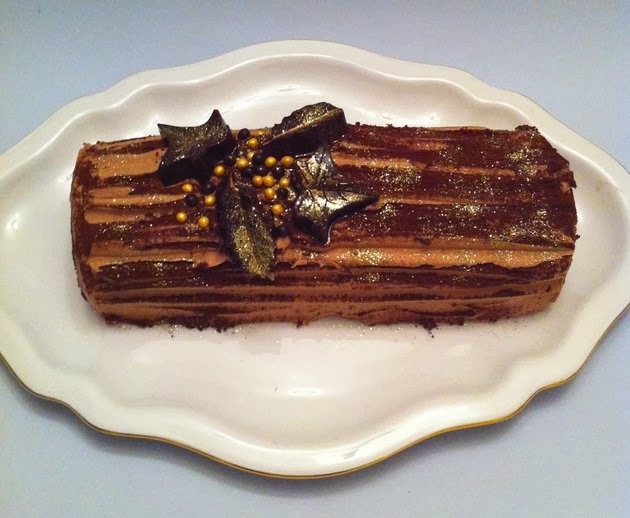 A flour less Chocolate & Chestnut log,this dark handsome secret of the festive season will definitely get your friends talking as it possesses a wow factor that attracts many , the way it looks is another . If, like me , you adore chocolate, then you'll love this wicked treat, which is very easy and quick to make .Made without flour, this dessert is deliciously light and moist. 2. Separate the eggs and using an electric whisk, beat the egg white to stiff peaks and set aside. Next whisk the egg yolks with the caster sugar until thick and pale. Fold in the melted chocolate. 4. Pour the mixture into a line baking tray and bake for 15 min until springy to the touch. 5. Cover immediately with a damp cloth to prevent the sponge from cracking until cool. Cream the butter and add the sugar ¼ at a time, until it is smooth and fluffy. Stir in the warm milk and Cognac. Continue to beat until smooth. Fold in the Chestnut purée. Replace the Cognac with lemon , lime or orange juice and add some very finely grated zest. Add 1 tsp of instant coffee to the warm milk for an espresso flavour. 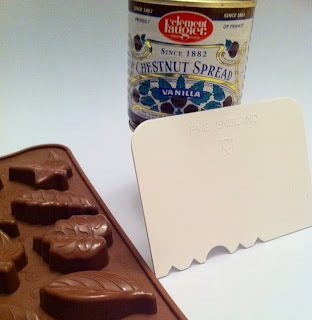 Make the chocolate leaves by pouring melted chocolate into the silicone mould. Allow to set in the fridge. Brush with a little edible glue and sprinkle with edible gold dust . Slide out the sponge onto a work surface ,then spread out the Chestnut butter cream evenly over the sponge . Starting from the edge closest to you , roll the sponge up and over away from you, while lifting the paper. Firm up the roulade by enclosing it with the paper and chill for 15 mins . Place the roulade on to a serving dish and spread over the remaining chestnut butter cream with a palette knife .Dust with Cocoa powder. Run the tines of a fork along the log to create a wood effect, or use a patterned scraper if you have one. Smooths the ends. 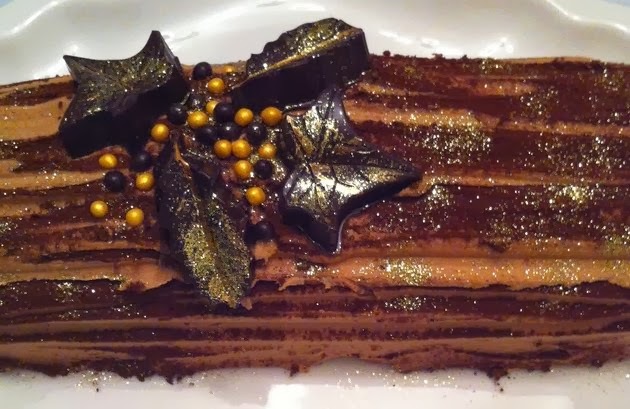 Finish with a sprinkling of edible gold dust / chocolate leaves and golden sugar berries for a festive look .